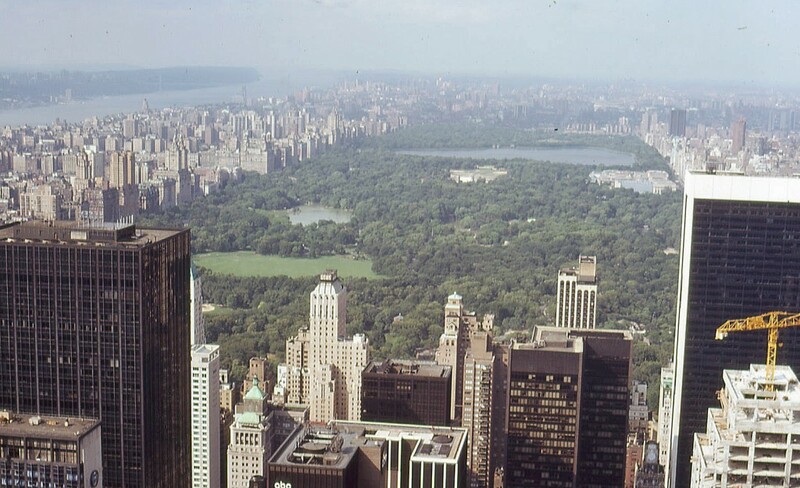 Manhattan would be overwhelming without Central Park, the 843-acre green oblong that relieves the remorseless gridiron of streets and avenues. With admirable prescience that arose from thirty years of debate, in 1853 the city’s authorities purchased the one remaining largely unused site within the 1811 street-plan for five and half million dollars. The park was laid out from 1856 onwards to the designs of Frederick Law Olmsted and Calvert Vaux. The principle of their “Greensward Plan” was that a variety of landscapes, ranging from formal gardens to near wilderness, should present themselves to visitors in a series of apparently natural transitions. The project took twenty years to complete, and occupied up to 3,000 workers. It is salutary to remember, when walking in Central Park, that to all practical purposes the entire landscape is artificial. At a time when buildings never reached a greater height than five or six storeys it was possible to arrange, by planting around the park’s borders, that the city would in no way encroach on the illusion of a natural landscape within. In fact, now that great tower blocks peer above the trees in most directions, an excitement that Olmsted and Vaux could not have predicted sharpens the Park’s appeal. The designers provided a range of occasional buildings around the Park – the cast-iron Ladies’ Pavilion, the Belvedere Castle and the Gothic Revival Dairy. The most formal composition of all, the Bethesda Fountain, is, significantly, set at an angle to the street-gridiron. The integrity of Olmsted and Vaux’s design has gradually been encroached upon by other, more obtrusive structures, such as the Delacorte Theater, the Wollman Memorial Rink, the Central Park Zoo and the Metropolitan Museum of Art. When Edward S Clark of the Singer Sewing Machine Co developed an apartment block at West 72nd Street in 1884 it was nicknamed the Dakota because it was so far out of town. As the empty plots disappeared under bricks and mortar – and later concrete and steel – Central Park remained as an astonishing piece of urban green half a mile wide and two-and-a-half miles long, stretching from Fifth Avenue to Central Park West (a continuation in all but name of Eighth Avenue) and from 59th Street (also Central Park South) to 110th Street (otherwise Cathedral Parkway). It’s impossible to overstate the importance of Central Park to New York life. It’s a breath of fresh air, a meeting-place for concerts and wakes, a setting for romance and sport. Sometimes it’s been – and still can be – unsafe and notorious for crime, but under normal circumstances, in daylight, it’s one of the most salubrious and enjoyable places in the whole of Manhattan. For details of Mike Higginbottom’s lecture The Big Apple: the architecture of New York City, please click here. This entry was posted in Exploring New York City on February 24, 2015 by Mike Higginbottom. I’ve never been able to understand why the borough of Doncaster has ignored its dark, neglected but intact Grand Theatre. Built in 1899 within sight of Doncaster railway station to the designs of John Priestley Briggs (1869–1944), a pupil of Frank Matcham’s, it’s bolted on to the overwhelming Frenchgate Centre (built as the Arndale Centre, 1967), with the dual-carriageway inner relief road clipping the corner of its stage tower. Most sources credit as joint architect Mr J W Chapman, the owner and lessee of the Old Theatre on Doncaster Market Place, who according to The ERA of April 1st 1899 “designed the whole of the arrangements, and personally drew the plans, which were passed by the Doncaster Corporation”. Chapman’s specification made the Grand a thoroughly modern theatre, electrically lit using its own generator, heated by a low-pressure hot water system, with a sprinkler system for firefighting. All eight dressing rooms were fitted with hot and cold running water. 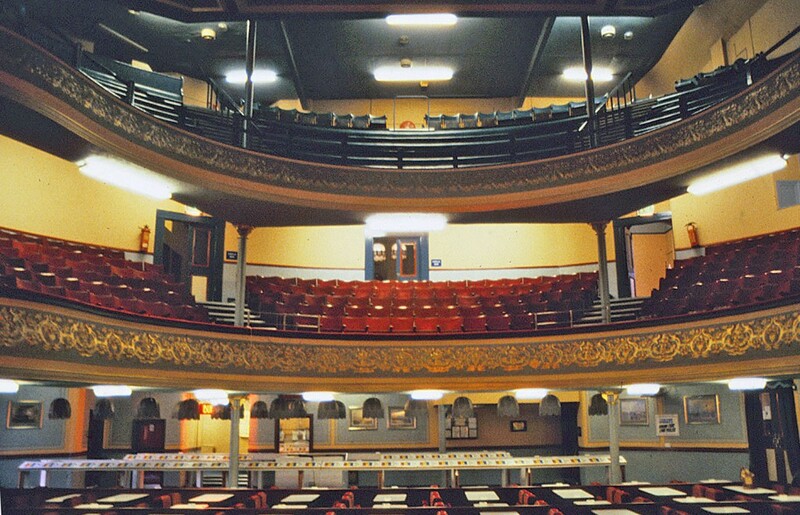 The auditorium has three levels, originally the orchestra stalls and pit, the dress circle and above that a balcony and gallery. The two boxes face into the auditorium and are not practical. The original terra-cotta, cream and gold decorative scheme was executed by Deans of Birmingham. The 26-foot proscenium is squarely proportioned, with brackets in the upper corners. The stage itself is 70ft wide, 32ft deep and 50ft high. The roll-call of performers at the Grand runs from Charlie Chaplin to Ken Dodd and Morecambe & Wise, and includes such Yorkshire favourites as Albert Modley, Sandy Powell and Frank Randle. It was where Julie Andrews’ debut took place when Ted and Barbara Andrews played in the December 1935 pantomime and carried their two-month-old daughter Julie onstage. The Doncaster Grand was one of the variety theatres featured in BBC broadcasts in 1930s. Live theatre timing was not as tight as broadcasting schedules, so the outside-broadcast unit had to carry whatever came on while they were live on air: at Doncaster they got Florrie Forde, a paper-tearing act – and a troupe of jugglers. The Grand was taken over by the Essoldo cinema chain in 1944 and it eventually closed in 1958. It operated as a Mecca bingo club from 1961 to 1990. In 1994, while under threat of demolition, it was listed Grade II. The Friends of the Doncaster Grand Theatre have campaigned ever since for the restoration of the building, which now belongs to Lambert Smith Hampton, the owner of the adjacent Frenchgate Shopping Centre. Doncaster Borough Council, meanwhile, has opened Cast, its performance venue “where you can watch incredible shows, share creative ideas and be inspired” – “a key driver for the creative industries and evening economy”: http://castindoncaster.com. It takes a moment to work out why it’s called Cast. Faced with an intransigent owner and a council facing in a different direction, it must be difficult for the Friends to maintain momentum in their campaign to find the Grand a place in the town’s creative industries: http://friendsofthegrandtheatre.co.uk. There are urban-explorer reports on the Grand at http://www.28dayslater.co.uk/forums/showthread.php/66786-The-Grand-Theatre-Doncaster-Nov-2011 and http://www.28dayslater.co.uk/forums/showthread.php/66941-Grand-Theatre-Doncaster-December-2011. 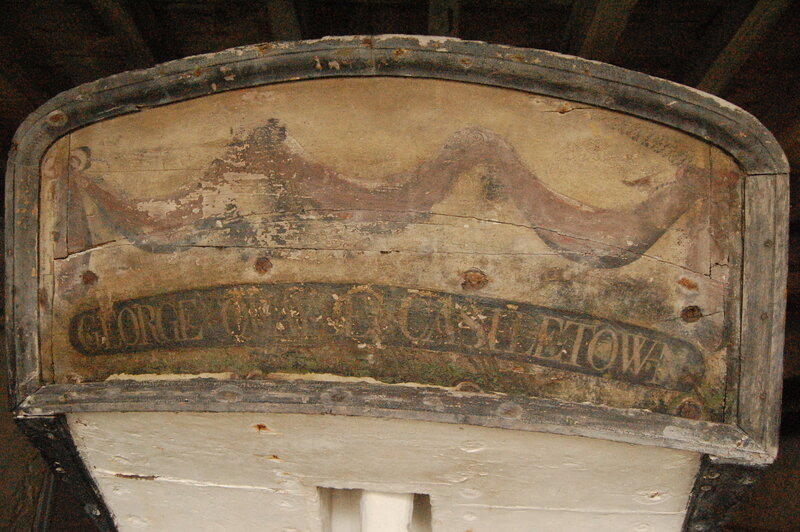 This entry was posted in Fun Palaces, Victorian Architecture on February 12, 2015 by Mike Higginbottom. Of all the signals of a government’s contempt for the passengers of its nationalised railway, none is more palpably cheap and nasty than the Pacer unit. They were built for British Rail at a time when economy was paramount, using a four-wheel chassis based on the experimental High Speed Freight Vehicle and bodywork derived from the standard Leyland National bus, another – more successful – attempt at nationwide standardisation built between 1972 and 1985 by British Leyland and the National Bus Company. Effectively a bus body on a freight-wagon chassis, with basic bus seats and inward opening doors, these lumpen machines pick up every bump and indentation in the track, screech round curves intended for eight-wheeled bogie vehicles and make particularly heavy weather over traversing points and junctions. They are noisy and most are underpowered. 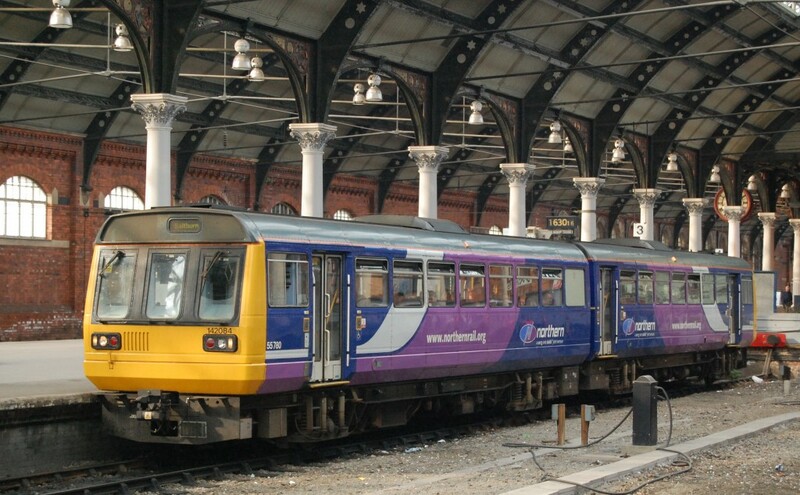 A rear-end collision at Winsford in 1999 showed up the physical frailty of the Pacer design: http://news.bbc.co.uk/1/hi/uk/383785.stm. Fortunately, the unit concerned was running empty, and the driver, at the opposite end of the train to the crash, was unscathed. But the rear cab was destroyed and the bodywork of both coaches detached from the underframes. These flimsy trains were built in the 1980s with a design-life of twenty years, but almost all of them are still in service, and they will be needed until at least 2020 because no new diesel railcar units are being built. A number of early-model Pacers were sold in the late 1990s to the Islamic Republic of Iran Railways where they have not found favour. There is, inevitably, a Pacer Preservation Society, with a magazine Pacer Chaser: http://www.pacerpreservationsociety.co.uk. One day, it will only be possible to ride these beasts in a museum. For the foreseeable future, however, regular passengers have no choice: http://www.bbc.co.uk/news/uk-politics-30945127. Update: A BBC News report indicates that the habit of patronising Northern commuters with life-expired rolling stock is set to continue with a proposal to upgrade 1978 District Line trains to work in Yorkshire and Lancashire: http://www.bbc.co.uk/news/uk-england-31536600. Further update: The award of the Northern Rail franchise to Arriva Rail North Ltd signals at last the imminent demise of the Pacers: http://www.bbc.co.uk/news/uk-england-35048842. This entry was posted in Transports of Delight on February 6, 2015 by Mike Higginbottom.